Yellowstone and Grand Teton National Parks are the focus of this journey, sitting side by side, yet offering such complementary landscapes and opportunities. The combination of prolific wildlife, unique geothermal activity, and sheer beauty is simply unmatched. From Bozeman, a trip along the Yellowstone River through the Paradise Valley leads us to our first stop, Yellowstone’s Mammoth Hot Springs. Before checking in to our accommodations, we’ll stroll the boardwalks around Mammoth’s subtly beautiful travertine terraces. Get to know about the park’s wildlife and history with a visit to the Albright Visitor Center. Wake early to begin the journey to the heart of the park, where we settle for two nights. With an eye out for wildlife – always! – we travel over Dunraven Pass, stop at the dramatic Grand Canyon of the Yellowstone, look for wildlife in Hayden Valley, and follow the shores of Yellowstone Lake to Old Faithful. There will be time before and after dinner to catch an eruption of Old Faithful Geyser. Our next day is all about gushing geysers, colorful thermal pools, and bubbling mud pots. Next stop, Jackson Hole, where the craggy Tetons cast their shadow. From a wonderful lodge in town, we spend days hiking in the Rockefeller Preserve, boating across Jenny Lake, strolling around the Jackson Town Square, and floating a scenic stretch of the Snake River. 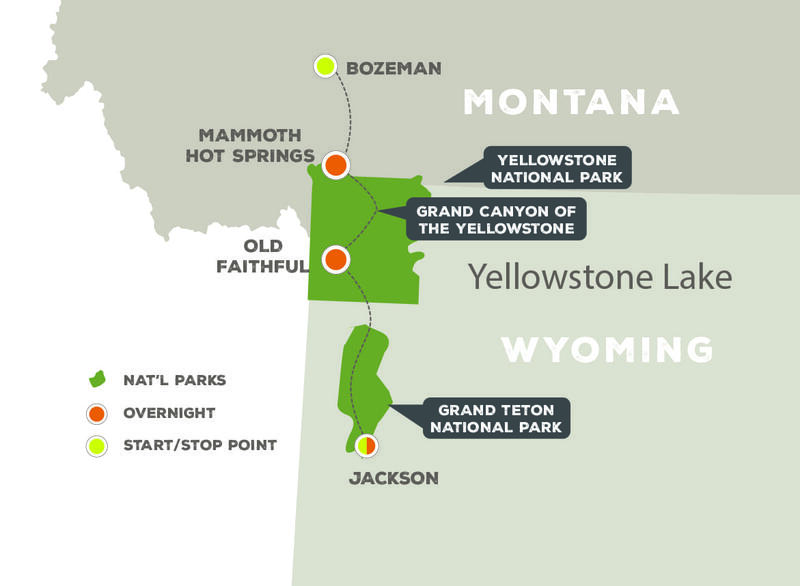 With a greater understanding of the essence of Yellowstone and Grand Teton, board flights home from Jackson. 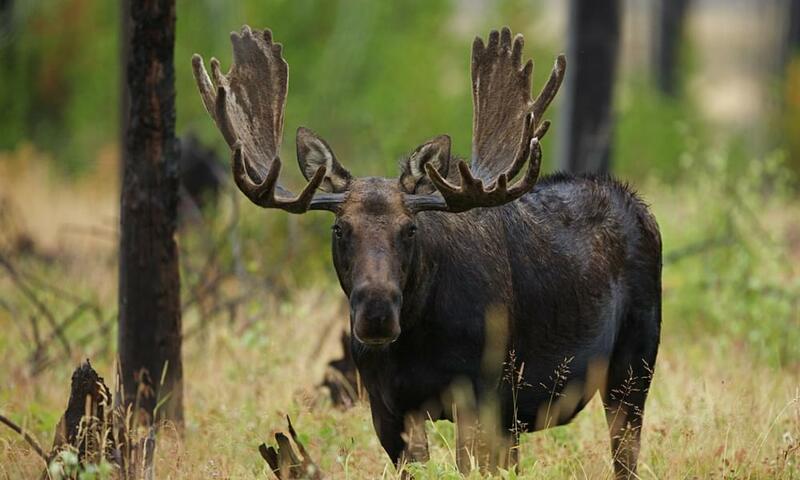 Wildlife: Your guide knows the best places to spot wolves, grizzly and black bears, moose, bison, bald eagles, and more. Natural treasures: See Old Faithful, the Grand Canyon of the Yellowstone, the Grand Tetons, and other iconic landmarks. Scenic river float: Relax on a quiet Snake River float with striking views and wildlife-watching opportunities. Jackson, WY: Explore on your own in the fine-to-funky galleries, shops, and restaurants of this fun, quirky, historic little town. This active trip takes place at elevations ranging from 5,000 to 8,000 feet, with 6-8 hours each day spent outside in potentially inclement weather. Activities include walking on uneven terrain for sightseeing and wildlife viewing, hikes from 1 to 3 miles, and a calm-water raft trip. Follow in the return-journey footsteps of Lewis and Clark over Bozeman Pass to the Yellowstone River, then leave that historic trail and turn south into the Paradise Valley headed straight for Yellowstone National Park. For our first, easy Yellowstone hike, the guide will choose a favorite trail near Mammoth Hot Springs. We’ll also wander the boardwalks through the fascinating and beautiful travertine mineral terraces, and have a chance to visit the Albright Visitor Center. Early this morning we’ll make our way toward the Old Faithful area over the 8,878-foot Dunraven Pass. First stop is the dramatic Grand Canyon of the Yellowstone. We’ll find the best vantage points for photographs, and enjoy a short hike. Moving on, we pass through the broad Hayden Valley—one of the best places in the park to view wildlife. Bison, elk, grizzly bears, coyotes, wolves, and a host of other species live here. We’ll arrive at the Old Faithful Snow Lodge in time for dinner. For dessert, catch an eruption of Old Faithful in the soft evening light. This whole day is dedicated to discovering, exploring, and learning about the bizarre and fascinating world of geysers, hot pools, and mud pots. Possibilities include a hike to off-the-beaten-path spots like Lone Star geyser as well as other amazing thermal oddities. This famous Upper Geyser Basin holds more active geysers than the rest of the world put together. Be sure to make time this evening to walk around the Inn and check out its rustic architecture and three-story interior balconies. Today we make our way out of Yellowstone and into Grand Teton National Park. The day’s happy highlight is a boat ride on Jenny Lake, a classic park experience. We’re on the lake for about an hour, soaking up the glorious scenery and learning about area history, geology, flora, and fauna. Later in the afternoon we arrive at our home for the next two nights, the lovely Jackson Lake Lodge. This morning we float the scenic Snake River through the heart of Grand Teton National Park. This is a calm water float with majestic views, and great wildlife-watching opportunities. Our river guides have a wealth of natural history knowledge and local stories as well. In the afternoon, the guide will gauge interest and energy levels in choosing the best activities to wind out the day. For tonight’s fond-farewell dinner celebration, we savor the innovative cuisine at the Rendezvous Bistro. Flights home are out of Jackson this morning. For more flight options, you can shuttle over the dramatic Teton Pass to the airport at Idaho Falls. 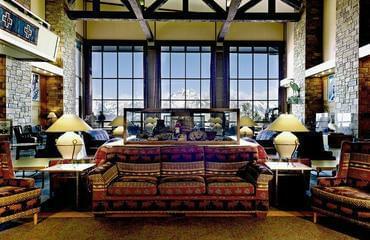 Situated near Old Faithful and the Upper Geyser Basin, Old Faithful Snow Lodge make a wonderful base for exploration. The lodge is one of Yellowstone’s newer accommodations and a beautiful example of classic “parkitecture,” with its heavy timber accents, exterior log columns, and cedar shingle roof. 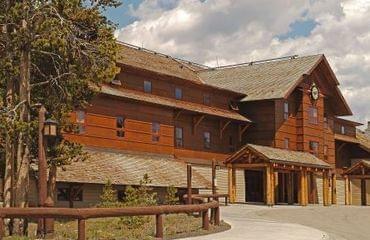 Built in 1903-1904 Old Faithful Inn is one of the most requested lodging facilities in the park. 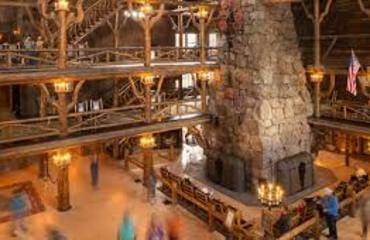 As a national historic landmark, this beautiful lodge was built with local logs and stone and is considered the largest log structure in the world. As you enter the lobby you are welcomed by expansive ceilings and a towering stone fireplace that features a hand-crafted clock made of copper, wood and wrought iron. 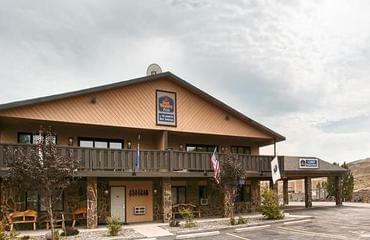 Amenities onsite include a full-service restaurant, lounge, snack bar and gift shop.